S. Brown and T. Pearson. 2009. 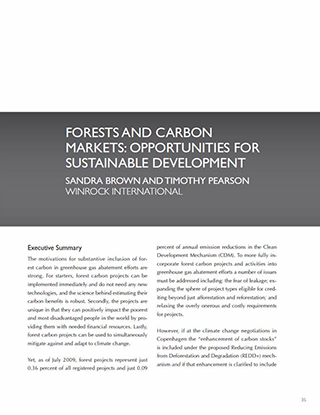 Forest and Carbon Markets: Opportunities for Sustainable Development. In: Climate Change Policy: Recommendations to Reach Consensus. 2009 Brookings Blum Roundtable “Climate Crisis, Credit Crisis.” Brookings Institution P. 35-41.